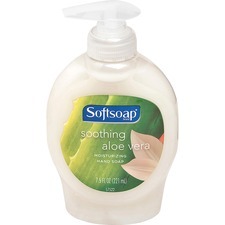 Softsoap Aloe Vera Hand Soap - 7.5 fl oz (221.8 mL) - Pump Bottle Dispenser - Moisturizing, Antimicrobial, Rich Lather - Welcome to TABS! 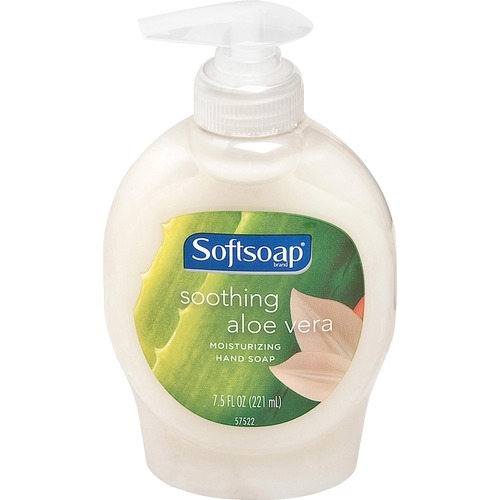 Premium, liquid hand soap with pure Aloe Vera extract cleans gently and quickly cuts through soils on skin. Soap rinses free fast for a squeaky clean" feeling. Gentle formula won't strip skin of natural oils. Preservative system helps prevent microbial contamination. Concentrated formula in a convenient pump dispenser allows a few drops to provide a rich cleansing lather.". Premium, liquid hand soap with pure Aloe Vera extract cleans gently and quickly cuts through soils on skin. Light moisturizers help keep skin feeling smooth and soft. Soap rinses free fast for a squeaky clean" feeling. Gentle formula won't strip skin of natural oils. Preservative system helps prevent microbial contamination. Concentrated formula in a convenient pump dispenser allows a few drops to provide a rich cleansing lather."